​Classes meet once a week for 2 hours on Saturday from 1:00pm-3:00pm. The class fee includes instruction, tools, studio time, clay, glaze and firing. and 1 week of glazing. 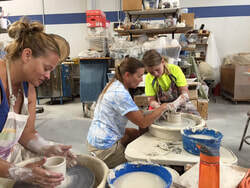 A ceramic class is a fun and creative break to a busy and hectic week. Class Fee: $120.00 - four week session, Siblings: same session $100.00.